Oh my goodness, friends and future friends! Can you believe that tomorrow airs the last episode of My Unfortunate Boyfriend? I'm so sad. I've been having so much fun going through this drama with everyone. Alas, there will be more dramas to come. So the final motions are being put into play during Episode 15. Let's talk about it. Last episode ended with Tae Woon meeting up with the inventor of the artificial sunlight, who turns out to be Ji Na's dad. Ji Na's dad learns that Tae Woon works for IM and is about to leave, when Ji Na walks in. Meanwhile the Senator seems to have softened. He sits Hee Cheul down and tells him that he's on his side whether he wins or not and asks him to treat Hye Mi well. 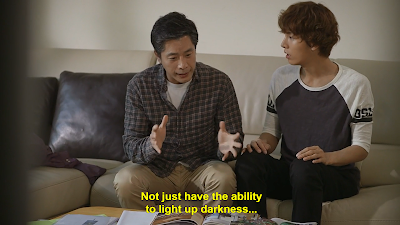 Ji Na, Tae Woon, and Ji Na's dad sit down and Ji Na explains their tangled fates. Both Ji Na's dad and Tae Woon are sorry to each other. Ji Na's dad apologizes for not accepting Tae Woon's dad's apology and says he wouldn't have died if he did. Tae Woon says it was an accident and not his fault and he himself apologizes for the crime that his uncle and dad committed against Ji Na's dad. Ji Na apologizes to her dad for not being nicer to him- so sweet! The three go visit the Chairman in the hospital. The Chairman and Ji Na's dad embrace and it's rather adorable. Ji Na and Tae Woon take a walk while the two of them reconcile. Ji Na teases Tae Woon about thinking she was a boy when they were little and he tells her she wasn't pretty then. She gets playfully mad and we see the old feisty Ji Na that's been missing the last few episodes return. He tells her that her being pretty isn't a factor to him. That's she's always just her. He walks her to a cab and sees her off. The Senator, continuing on his spree of softening up releases his spy to work for just Hee Cheul so he doesn't have to report to two bosses anymore and the spy is very grateful. He mentions something about learning to trust the world and it flashes back to Hye Mi telling him he needed to trust the world. It seems he's listening to his daughter. Tae Woon goes back to the hospital where the Chairman and Ji Na's dad are still catching up. He sits outside the room going over paperwork for the competition at work. In the morning Ji Na's dad comes out and the two of them go to breakfast together. While at breakfast, Tae Woon asks Ji Na's dad, whom he calls "dad", to help him get back to the original concept of the artificial light for his competition at work. Ji Na's on her way to work and is happy to hear that the two are together When she goes inside she finds that the pretty office lady and Mr. Eccentric are two weeks pregnant. They both hand her an invitation to their wedding and tell her she has to come even if she doesn't get the permanent position. Oh yeah, she's still competing for that, huh? Ji Na's dad and Tae Woon have gone back to the Chairman's house to work on the presentation. Tae Woon tells Ji Na that her personality comes from her dad, that he's passionate and full of life like she is. It's adorable to see the two of them working together. At work the next day, Team B is anxious to find out who the candidate for CEO that's competing against Hee Cheul is. They still don't know it's Tae Woon. When he shows up they're understandably shocked. They had no idea he was the Chairman's nephew. Hye Mi and Hee Cheul are also preparing for their presentation and Hee Cheul is much more aware of and kind to her now. He even invites her to the river with him later to work. After work the office ladies take Ji Na aside and grill her on Tae Woon and why she didn't tell them. She says she didn't know for very long. They suggest that she just ask him to get her a permanent position at the company, but then recant their statements when they remember Ji Na went to a prestigious school. Ji Na looks guilty, because she really didn't go to a prestigious school. Hee Cheul and Hye Mi go to the river for what's supposed to be work, but really they sit there and have a pleasant conversation. It's surprisingly romantic and Hee Cheul is being attentive to her for once. He mentions that he'll go on a trip with her if they lose, but if they win he'll be busy and there's something he wants to get. She takes this to mean Ji Na. Hye Mi calls Ji Na out for drinks and makes a plea with her. She shows Ji Na that she has her resume that shows her education, but says it's not a threat. She asks Ji Na to leave the company if Hee Cheul wins because she believes he'll pursuit Ji Na if he wins. For once Hye Mi is being quite sincere, and is pretty straightforward with her motives. Hee Cheul goes to visit the Chairman in the hospital after finding out that the Chairman was able to obtain the mysterious Director Ma's stocks. Hee Cheul ells him that will only work if his plan to have Tae Woon run for CEO is in tact, but he is going to destroy that plan. The episode ends as Tae Woon and Hee Cheul both receive envelopes that seem to have some shocking information inside or interesting news at the very least. So that's our plot. Here's what I think. -I bet Ji Na's love for Tae Woon doubled seeing how wonderfully he treated her father. -When did the Senator become a good guy? I'm so confused. He was pure evil last time I checked. Or maybe he was just greedy? -Thank you Ji Na for apologizing to your father. That was the one bone I had to pick with you and I knew you would come around. He's such a good dad after all. -OMG the reconciliation scene between the Chairman and Ji Na's dad. I was on the verge of tears. It was the sweetest thing. -It was nice to see the feisty Ji Na back for a bit, yelling at Tae Woon for saying she wasn't pretty. That's the Ji Na that I first grew to love! -At first I was mad at Tae Woon when he wouldn't tell Ji Na that she was pretty, but then I realized how awesome it was. He knows she's pretty, but that doesn't have any bearing on how he feels about her. He truly loves her for who she is. You don't see that level of deepness in a drama very often. -I'll concede to the critics who say that Tae Woon's naivety was a bit unrealistic (I mean, it's a drama, you can't expect 100% real-to-life situations), but since he left his greenhouse he's become quite manly. -I love how happy everyone is over the pretty office lady and Mr. Eccentric's pregnancy. Unplanned pregnancies are sometimes looked down on, but they are so excited to start their lives and a family together. -Hee Cheul and Hye Mi are actually adorable together now that Hee Cheul's paying her some attention. -Bravo to Hye Mi for being so straightforward. It's a nice change. I was getting sick of her manipulation. -Was it just me or did Hee Cheul come really close to punch-dancing during that one scene? Also, it's super uncool to threaten a sick old man in the hospital. Will Hee Cheul ever learn to be decent? So that was episode 15. Sadly Episode 16 will be our last recap, but I'll be back with some special-themed My Unfortunate Boyfriend posts next week. Stay tuned. Need to catch up before tomorrow's finale? You can catch up on every single episode of this seasons so far below.